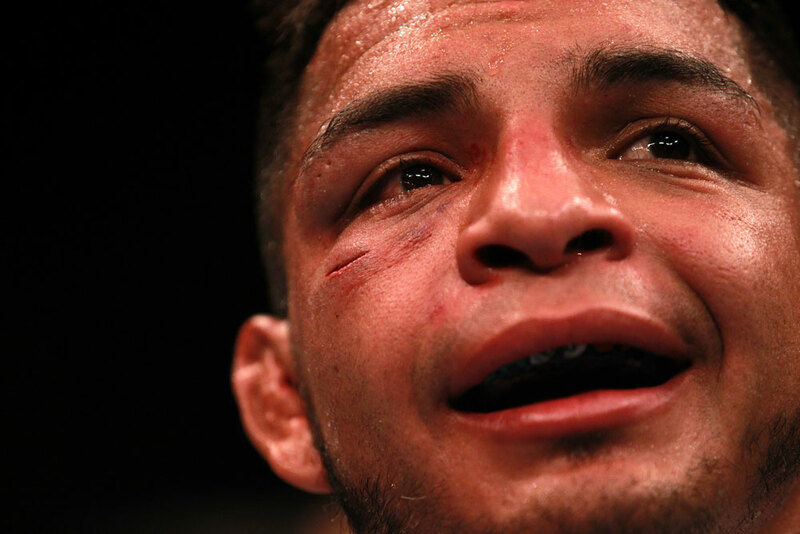 Despite being in the midst of a three fight losing streak, Leonard Garcia is in a remarkably good mood heading into his UFC 155 bout with Max Holloway this Saturday in Las Vegas. Of course, the affable and smiling featherweight rarely strays from the sunny side of the street, attitude-wise, so this might as well be business as usual for the Texan. But when you ask him where he sees himself heading into what may be the most pivotal fight of his 13 year career, nothing changes in his demeanor. Some fighters are just like that, needing that proverbial back against the wall feeling to truly bring the best out of them. For Garcia, it was a feeling that listening to everybody else and not his own gut had taken away what always made him special. So in an effort to get better and show off different aspects of his game while letting fans know that he could be disciplined in the Octagon, he got civilized. And everyone knows that in the Octagon, Garcia is at his best in the midst of chaos, not a civilized mixed martial arts match. Since 2011, Garcia hasn’t entered the winners’ circle in the UFC, getting submitted by Chan Sung Jung in their rematch, losing a Fight of the Night decision in another rematch against Nam Phan, and then dropping a three round nod to Matt Grice. Each fight was competitive, but Garcia couldn’t get over the hump to get his hand raised. Along the way, as he promised a more disciplined and technical fighter, his longtime fans wondered where the old “Bad Boy” had gone. “They were like, ‘We love you, man. What are you doing different?’ ‘Where’s the old Leonard? What’s going on?’ ‘Yeah, you’re getting these Fights of the Night, but you used to get in these situations and win. Where is that guy at?’” recalled Garcia of the reaction to his losing streak, which was mixed in with various injuries that kept him from fighting at the rate he wanted to. Luckily, in this sport, three losses can be quickly erased by one win, at least from a mental standpoint, and even with a late change in opponent from Cody McKenzie to Holloway, it doesn’t matter to Garcia as long as he brings his old style back to the Octagon in order to fight his fight. When you hear that from someone who will often break out with an ear to ear grin in the midst of a prize fight, that means something, and the 33-year-old hopes that while Saturday’s bout is the end of his 2012 campaign, maybe it’s going to be the start of something big for next year.